Blog Teams Chile Analysis: Chile rely on their pressing but who are the two individuals key to their success? Analysis: Chile rely on their pressing but who are the two individuals key to their success? Some will tell you Chile are the surprise package of the tournament, others will tell you they were expected to progress past a group containing the Dutch and Spaniards. Both statements are certainly debateable, but the results the Chileans managed to get and the performances they’ve put in shouldn’t surprise anyone. The inferiority of the Spaniards is the only surprise in the group, Chile were always going to turn up with that level, just the fact that crucially Spain didn’t wasn’t expected. The first thing one will notice about the Chilean side is their ability to press, their biggest strength, essentially using ‘attack’ as a form of defence. They aren’t quite the household team, but this pressing ability as a single unit makes them extremely dangerous and just the sort of side a big team under-pressure (to succeed at the World Cup) would look to avoid. But though the biggest thing going for them is their ability to play as a unit, there are some individuals essential to their success, and certainly their system. The Barcelona man announced himself at this World Cup with a superb opening few minutes against Australia, scoring one and setting up another. His ability on the ball have been crucial for the Chilean side, and that showed in the opening game. Admittedly he hasn’t quite had the impact in the other two games as he did vs the Aussies, but that’s purely because he’s failed to get on the scoresheet, his impact has remained vital. Alexis Sanchez’ ability with the ball has always been known, but he has received some criticism when without possession. That theory will have to be re-thought. Against the defending champions Spain, Alexis Sanchez’ clever footballing knowledge was evident. Though he didn’t see as much of the ball as he would have liked, his ability to bring others into the game was crucial in the success. Again, as mentioned, Spain were of inferior quality but the speed of Chile’s attack was incredible. He worked the wings well moving from his central position allowing the other attackers to get into the game, pulling defenders away with him. Also crucially noticeable in the game against Spain was that ability to press from the front. Alexis Sanchez, playing in the attacking third, had the most number of successful tackles (3) among all the Chile players, and also managing 2 interceptions. Every World Cup you get a whole fleet of new football fans, some who only watch the tournament while others carry on beyond. Tell any of these new fans that Gary Medel was relegated just about a month ago from the top division, he might just be a bit shocked. 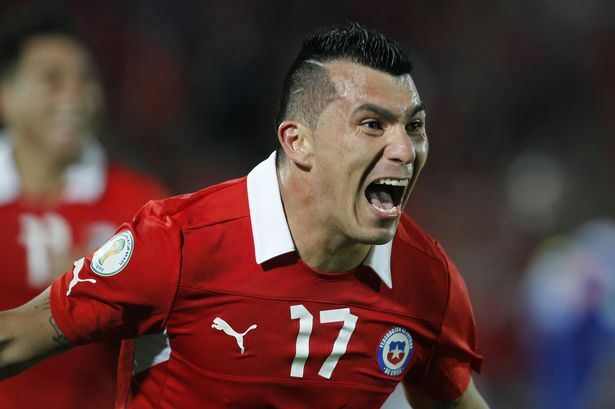 Medel has been a stand-out performer for the Chileans, significantly again versus the defending champions. Medel’s task against Spain was to be involved in one of the ugliest battles in the tournament (no pun intended), against lone striker Diego Costa. A mouth-watering battle on paper, a disappointing one in reality; and from Medel’s point of view, one of the easiest he’d have at the tournament. Diego Costa has been largely absent in Brazil and particularly against Chile, not being able to fit into the squad or the system. His role was further advanced when playing against the Dutch. Required to be defensively solid, Medel has a more expansive role, required to get play going from the back. The Cardiff player completed 103 passes which was the highest in the game by some margin; the most passes by a Dutch player were Dirk Kuyt with 34. Thus Medel plays in the back line but retains his midfield tendency. He’s a proper monster in defence, not afraid to get stuck into tackles while he has the intelligence to mark an opponent out of the game, which he would be able to do against an opposing centre-forward. But as the Chilean’s frantically press forward it leaves them disorganised, Gary Medel acts as the player whose required to control possession while his team-mates get back into position and form a more systematic approach. He’s the player they’ll look to to get attacks started, ensuring possession is retained but he’s unlikely to contribute directly in a creative sense. Medel also has a tendency to pass primarily down the right hand side, combining well with Alexis Sanchez. Chile’s strength certainly lies in their ability to press opponents but when allowed possession, Gary Medel is the man to get play moving, while Alexis Sanchez is who he’ll look for. Their Round of 16 opponents are Brazil, favourites & hosts. The pressure is certainly not on the Chileans, tactically, that Brazilian side is capable of caving in when pressed. Sanchez yes, but Medel will have an important (and hopefully excellent) game.